This stuff is exceedingly good. I mean it. Want something exotic for lunch at work? This is it. We eat everyday food from other countries and think it exotic. I guess that’s why in other countries, people eat American fast food. No, that’s totally wrong. I hope. Indian food is some of the most tasteful food in the world. In fact that whole area of the globe is ripe with flavor. I guess that’s because so many different spices grow there in large quantities. Remember, Columbus set out to find spices from the East. He just went wrong and stumbled upon America. The Trader’s Paneer Tikka Masala is first-rate. 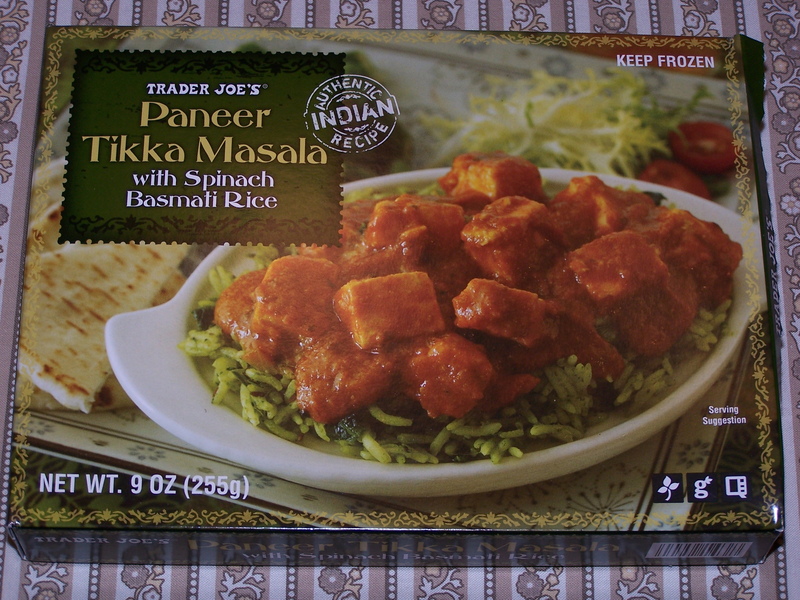 Unlike most of the frozen box food we buy from the local big supermarket, which serves a purpose for filling our belly during lunch and being palatable, The Trader’s Paneer Tikka Masala is just about restaurant grade. It sort of raises the question why all those other frozen boxes can’t be better. But, do we really care at the moment? TJ includes all the wonderful flavors any of you have tasted if you’ve ever visited an Indian restaurant. The green basmati rice threw me off a little at the beginning. When I read the box, and yes there is a picture of the box below, I discovered this is spinach basmati rice. Never mind that, it’s the same great dryish wonderfully flavored mildly hot basmati rice you may have had in the past. No water-logged mush like some other frozen boxes contain. 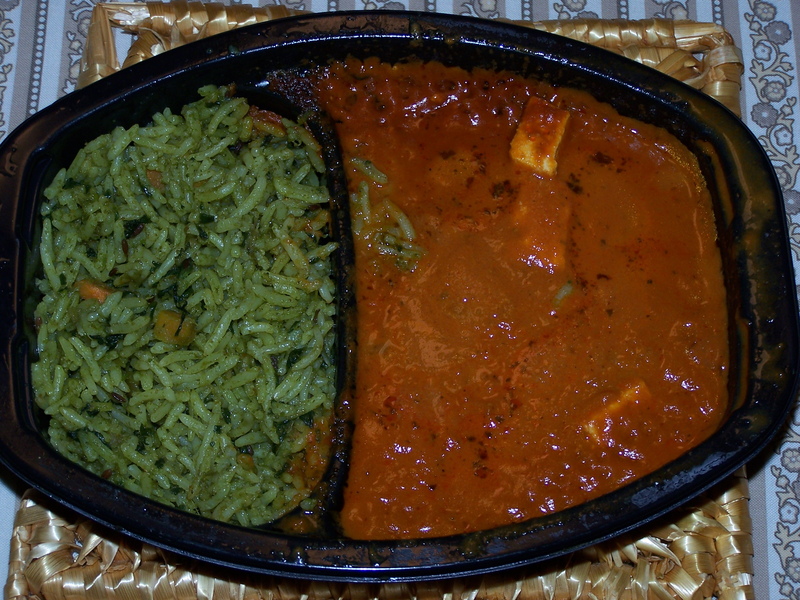 The masala tomato based sauce is smooth, containing all the different flavors that make Indian food exceptional. There’s a nice medium heat to the sauce which is probably appropriate for a quick lunch at work. No need to have a pitcher of water present. What is Paneer Tikka Masala? Paneer is fresh (unaged) cheese. Tikka, as used in this product, means small pieces. Masala is a blend of spices. To demystify the name, we now have, small pieces of fresh cheese in a tasty sauce. This should then give us license to take the exotic description off the product and eat it more often as an ordinary everyday food. We will be much happier for doing that. This entry was posted on 09/25/2010 at 08:20 and is filed under Recipes, food, cooking and related items, Trader Joe's, Vegetarian. You can follow any responses to this entry through the RSS 2.0 feed. You can leave a response, or trackback from your own site.